The 888poker LIVE tour got off to a flying start for 2018 when it descended on Aspers Casino in the heart of the British capital. A massive crowd of 547 entrants created a £216,565 prize pool and this was shared among the top 54 finishers in the £440 buy-in event. Players flocked to Aspers Casino in droves over the course of four starting flights. Day 1a saw 118 players take to the felt while Day 1b was slightly busier with 158 players entering the fray, with Day 1c attracting 215 players. The fourth and final flight, which took place on the same day as Day 1c, added 56 entries to the tournament. When the dust had settled after the quartet of Day 1s, only 88 players remained in the hunt for what would be a £42,957 first-place prize. A min-cash weighed in at £975, but as a generous gesture, 888poker gave those players who finished in 55th to 63rd place a consolation prize of a WPT500 entry worth £420. Boris Velev, Pino Marco, Shane Carter, Serdar Yusuf, Lee Champion, Ronald Zapantis, Pierre Tassin, Kully Sidhu and Christian Alessi all secured WPT500 seats, while the likes of Gerald Ringe, Leon Louis and Tony Poulengeris all made it into the money places. £4,275 was the least anyone on the final table would take home and this is the sum Edmund Anderson collected for his ninth-place finish. Anderson was followed to the rail by Kahled Adimi, Daniel Stanway, Carlos Gonzalez and Erimas Livonas. Four-handed play spanned several hours so it was no surprise that the final quartet of players decided to strike a deal for the remaining prize pool. The players agreed to award the trophy to the player with the most chips at the time, Jonathan Bowers, with the prize money divvied up according to ICM. This meant Bowers took home £30,634, second-placed James Simms banked £28,464, Eric Le Goff’s third-place finish was worth £24,068 and Ali Sakallioglu collected £23,280 for his fourth-place finish. It has been a solid start to 2018 for Bowers as he took down a £220 buy-in event on Feb. 1 for £12,460. 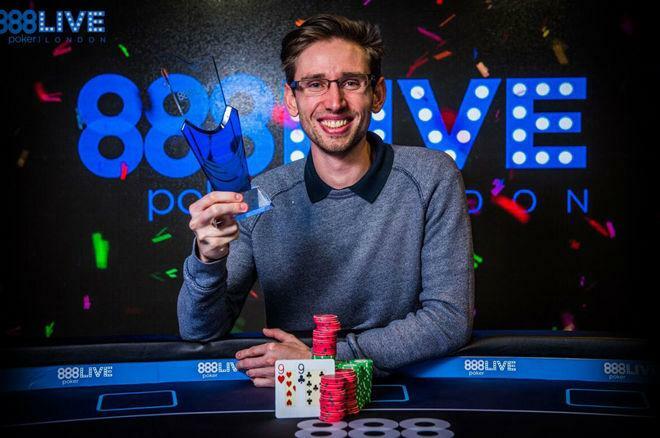 Bowers is no stranger to 888poker events either because he was the runner-up in the £2,200 High Roller at the 888Live Festival London in Oct. 2017 for a £36,115 score. He’ll surely be back at Aspers Casino for future 888 events. The festival will also have happy memories for Beth Cape who took down the 888poker Live Charity Event and secured $5,000 for her chosen charity, Mind. Cape topped a field that was home to 888poker ambassadors Chris Moorman and Vivian Saliba, plus a host of football stars including Watford’s Adrian Mariappa and Chelsea’s Michael Hector. Next up for the 888poker LIVE tour is a trip to the Romanian capital of Bucharest. This festival runs from Feb. 28 through to Mar. 5 and features among its schedule a €288,000 guaranteed Main Event costing €888 to enter, or much less if you win your way into it online at 888poker.